Bringing outdoor adventure to thrill-seeking hunters since 2000. 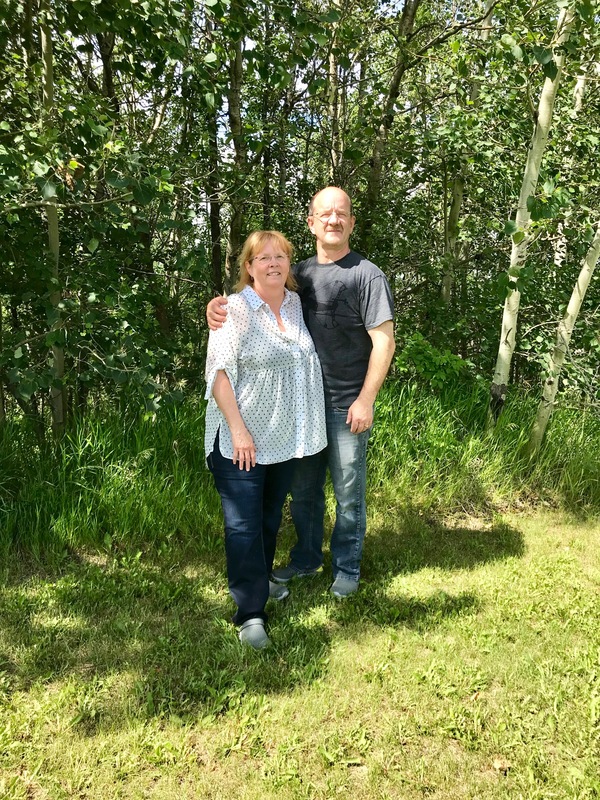 Blue Sky Outfitting is located in McLennan, Alberta, Canada, and we pride ourselves in delivering on our promise of a great trip. Whether you come for waterfowl, moose, bison or wolves and coyotes, you’ll see that we stand behind our words and go the extra mile to make sure your time with us is memorable for all the right reasons. Long before we became owners, we were adventurers just like you. We started Blue Sky Outfitting in 2000 to share our love of outdoors. We began with waterfowl and have grown our trip offerings to include moose, bison, wolf and coyote. After that growth, a tempting opportunity presented itself. That opportunity was Aylmer Lake Lodge in the beautiful Northwest Territories. This remote fly-in lodge is the newest jewel in our crown – and it has already brought anglers from all over to enjoy the best fishing anywhere. Your Blue Sky hunting trip will be led by trained, experienced guides who know the hunting area and are adept at calling and stalking. Our equipment is well-maintained and designed to make your trip a productive one. Are expensive duck loads really worth the money, or does steel shot work just fine? What IS a successful hunt? Northern Air (http://flynorthernair.com/) offers many daily flights from Calgary and Edmonton to Peace River. 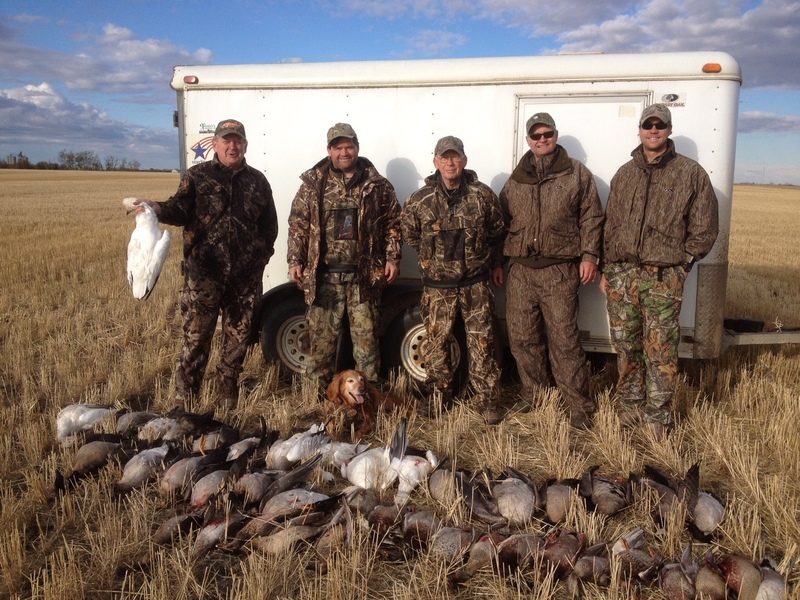 Hunters who have a hunting license suspension, in Alberta or elsewhere, are prohibited from applying for or obtaining a recreational hunting license in Alberta. For further information, you can contact Alberta Fish and Wildlife Enforcement Field Services at 1-780-427-4943. Youth hunters are welcome in Alberta but must be at least 12 years old to hunt under their own licence. All youth less than 16 years of age require parental permission to purchase a licence. To hunt with a firearm, hunters under 18 years of age must be accompanied by a parent, a legal guardian or a person 18 years of age or older who has the written permission of the parent or legal guardian. Archery equipment does not fall under these requirements and therefore has no declaration form. For your firearms, a simple one-page form must be filled out to obtain a temporary Canadian Firearms permit. We will provide this with your hunt contract. This form (5589e) can also be downloaded or mailed to you well in advance from the Royal Canadian Mounted Police Canadian Firearms Program. On the website rcmp-grc. gc.ca/cfp-pcaf, follow the links on the left-hand side for visitors/non-residents and then download the “Non-Resident Firearms Declaration” (5589e). Completing this in advance should reduce the time required to clear customs. A confirmed declaration costs $25, regardless of the number of firearms listed on it. It is only valid for the person who signs it and for those firearms listed on the declaration. If you are coming with others who will be using firearms in Canada, each of you will need to meet these requirements. The declaration must be signed in front of a Customs Officer. The Canadian dollar fluctuates against the US dollar. Visit a Currency Exchange website such as xe.com for up-to-the-day exchange rates. Exchanging US dollars for Canadian dollars is easily done at any bank in Canada, or in currency exchange kiosks at the Calgary and Edmonton International Airport. If you require extra cash, ATMs are easily found in any town across the province. Fees may apply. Credit cards are almost always accepted for virtually any purchase throughout Canada – Visa and Mastercard are the most widely accepted, followed by American Express. Discover Card is not widely accepted in Canada. You will be required to clear Canadian Customs regardless of whether you fly or drive. You will need to present a valid passport at the border crossing. At Canadian Customs, you will be asked several questions about the purpose of your trip, the length of your stay, where you live, who you are hunting with, etc. It is a very good idea to have some written verification like your contract to show the address of your destination. At this point, all alcohol, tobacco and firearms must be declared. This process usually goes quickly and you should soon be on your way. Criminal records, even a DUI, can prevent travel into Canada. If you have any concerns contact Canada Border Agency Services. If you have any type of criminal conviction, even if you’ve been charged and not convicted, you should notify us or call Canada Border Crossing Services well in advance so that clearance can be arranged. We can help arrange for meat processing, but due to the limited duration of most hunts it may be a problem for your animal to be completely processed before your departure. Plan ahead and make arrangements with us if you intend to take home large quantities of meat. There are many quality taxidermists in Alberta. It is wise to find out not only what the expected turn-around times are, but also the costs of shipping a completed trophy to you. This can be a very simple option for getting your trophy home, but there will be extra fees and charges for things such as export permits, packaging, shipping and brokerage fees. Exporting your game back home is a relatively simple procedure as long as you export the animal (head, hide, meat, etc.) as personal baggage. Your hunting license will act as your export permit, so keep it handy as you leave Canada. You will also need to fill out a US Import/Export permit (Form 177). Although these can be picked up at customs, the process is simplified if this form is filled out in advance. We can provide more details. Transporting your game home is obviously easier if you are driving, but the requirements are still the same if you fly, as long as you comply with your airline’s procedures. You may be checked by Alberta Fish and Wildlife Enforcement officers when crossing the border back home. This process should be straight forward, provided you have your WIN number and license(s) handy. Know the name of your outfitter (Blue Sky Outfitters) and guide, as well as a general idea of where you were hunting (WMU). Remember, while your license serves as your export permit for most species, you cannot take home wildlife parts/meat, other than that which you harvested, without an additional export permit. Each species has slightly different export requirements, so check with us for those specifics and plan in advance what you will do with your harvested animals. Be aware that it is unlawful to allow the edible meat of any game bird or big game animal, except cougar or bear, to be wasted, destroyed, spoiled or abandoned. And you, the hunter, are primarily responsible for the care of that meat. If you are planning to bring your birds home with you, regulations require you to have a soft-sided ice chest that will meet airline requirements and hold your birds. If you’d like us to provide a cooler, the cost is $60.00US. All imports into the us of sport-taken migratory birds may only be imported by the person who hunted them. A hunter cannot give the birds to another person to take into the us on their behalf. Any mounted/taxidermied birds, geese, or cranes can only be imported in the us when accompanied by a us migratory bird import/export permit. This may have to be applied for in advance. No other types or forms of migratory birds will be allowed into the us, including sausage or processed meat. All illegal birds and/or meat will be seized, and charges will be laid. These are general conditions – please contact your specific airline for their requirements. Archery equipment is generally accepted as part of a customer’s baggage allowance. Archery equipment is defined as one or a combination of the following: One bow, one quiver containing arrows and one maintenance kit. These items must be encased in a container of sufficient strength to protect the items from damage. Cases containing more than the above listed items may be assessed an excess baggage fee. One item of shooting equipment is generally accepted as part of a customer’s checked baggage allowance. When checking a firearm, you must declare to the representative that you are checking a firearm. If a security checkpoint is prior to the ticket counter, you must declare the existence of a firearm to security personnel. Present firearm(s) unloaded and sign a “Firearms Unloaded” declaration. Lock the firearm(s) in a hard-sided, crush-proof container and retain the key or combination. Maintain the entry permits in your possession and ensure ammunition is packed separate from your firearm(s) in the manufacturer’s original package or securely packed in plastic/carbon fibre, wooden or metal boxes. One item of shooting equipment usually contains: rifle case containing two or fewer rifles (with or without scopes), one tool kit and up to 11 pounds of ammunition, if it does not exceed 200 rounds. Ammunition in excess of 11 pounds per passenger or that contains incendiary projectiles is prohibited. We will provide you with suggestions for specific calibres and cartridges for your hunt. In Alberta, it is unlawful to hunt game with a calibre less than .23 or a shotgun calibre/gauge of less than .410. Centrefire magazines are limited to five-round capacities and shotguns are limited to carrying three rounds. It is unlawful to hunt big game with ammunition that contains non-expanding bullets. This is not an extensive list of regulations. Please contact the Canadian Firearms Program (1-800-731-4000or rcmp-grc.gc.ca/cfp-pcaf/) or talk to us for more information. Bow hunting is extremely popular in Alberta, with trophy deer, elk, bear, sheep, pronghorn antelope, moose and predators taken each year. Bow hunters enjoy seasons for most species that start as early as late August and last until the end of rifle season. Hunters must purchase a Bow Hunting Permit in addition to their licence/tag – we will advise and assist you with all the logistics. All hunting bows must have a draw weight of at least 40 pounds at a 28-inch draw, and all arrows must be at least 24 inches in length and have a broadhead with at least 7/8-inch cutting diameter. There are several archery-only zones in Alberta as well. See the Alberta Hunting Regulations at http://mywildalberta.com or contact us for more information. Crossbows are permitted during regular rifle seasons only. Crossbow hunting is not permitted during the archery seasons in Alberta, except under special permit for mobility-impaired hunters.Crossbows must have a draw weight of at least 100 pounds and broadheads must have a cutting diametre of at least 7/8-inch. Crossbows are not permitted in archery-only zones. Please contact the Alberta Fish and Wildlife Division for more information. Alberta is on Mountain Standard Time and observes daylight saving time. Sunrise ranges from 5:57 am on May 1st to 5:34 am on May 30th. Sunset ranges from 8:04 am on May 1st to 8:27 pm on May 30th. Sunrise ranges from 6:52 am on September 1st to 7:49 am to September 30th. Sunset ranges from 8:46 pm on September 1st to 7:29 pm on September 30th. Sunrise ranges from 7:51 am on October 1st to 8:54 am to October 31st. Sunset ranges from 7:27 pm on October 1st to 6:12 pm on October 31st. Sunrise ranges from 8:57 am on November 1st to 8:56 am to November 30th. Sunset ranges from 6:07 pm on November 1st to 4:19 pm on November 30th. Alberta is known for having warm, dry summers, and cold winters with heavy and frequent snowfall. Fall hunting seasons, however, can see extremely varied weather conditions. During late August and running through September, average temperatures hover between 50 and 55 degrees Fahrenheit. In October, average temperatures drop to about 35 to 45 degrees. November signals the beginning of winter in our hunting area. The days are quickly getting shorter and the weather can swing wildly from tolerable to biting cold when the wind picks up. This is also the time when snowfall stays for the winter. November average temperatures are below freezing, at 14 to 32 degrees. December and January see some of the coldest temperatures, regularly dipping to well below zero. For spring, hunters can expect mild temperatures, averaging around 30 to 50 degrees. Daily high temperatures increaseby 13°F, from 52°F to 65°F, rarely falling below 38°F or exceeding 78°F. Daily low temperatures increaseby 13°F, from 30°F to 43°F, rarely falling below 17°F or exceeding 53°F. Daily high temperatures decreaseby 10°F, from 68°F to 58°F, rarely falling below 45°F or exceeding 80°F. Daily low temperatures decreaseby 8°F, from 46°F to 38°F, rarely falling below 28°F or exceeding 54°F. Daily high temperatures decreaseby 19°F, from 57°F to 39°F, rarely falling below 24°F or exceeding 71°F. Daily low temperatures decreaseby 13°F, from 37°F to 24°F, rarely falling below 11°F or exceeding 47°F. Daily high temperatures decreaseby 19°F, from 29°F to 10°F, rarely falling below -10°F or exceeding 40°F. Daily low temperatures decreaseby 22°F, from 18°F to -4°F, rarely falling below -25°F or exceeding 30°F. WHAT SHOULD I WEAR TO HUNT IN ALBERTA? There are no regulations in Alberta requiring specific clothing colours. Since weather can change abruptly, layers are key as they allow for adaptability to changing weather patterns. A moisture wicking base layer, along with a few insulating layers and a waterproof/breathable outer layer is best. This allows you to layer up when it’s cold and peel it off if it warms up. Of course, warm and flexible gloves, warm headgear and warm socks are also important. Many hunters choose to wear scent-blocking garments. Camouflage can be tailored for the terrain and conditions you hunt – northern boreal forest, prairie grassland, snow, etc. If you’re hunting from a tree stand or ground blind, consider over-boots and over-mitts for added warmth. Finally, ensure all clothing is quiet (soft material). We can provide you with specific recommendations for the time and locale of your hunt. Ensure you leave extra time on both ends of your trip for unexpected delays. Being stressed while trying to get to camp or leave camp on a very tight schedule can put a damper on your trip. Canada is officially on the metric system – distances, speed limits and temperatures will be in metric. However, most Canadians are fluent in both metric and imperial measures. International mobile phone roaming rates can be very high. Check with your service provider before entering Canada to avoid unexpected charges. Travel medical insurance is well worth the cost. It’s usually just a few dollars a day and can save you thousands of dollars in case of an emergency. “For anyone looking for a different kind of adventure, I would highly recommend Blue Sky Outfitters wood buffalo hunt! My father and I hunted with Kevin in May. We found Kevin to be a very hard-working guide. He was very familiar with the area and was honest. (No B.S. to deal with!). Most bison hunts are quite easy, not this one – you actually have to hunt for them up here! These animals can disappear into the timber with a couple strides! Of course, the animal’s size is a little overwhelming – larger than the bison in the lower 48. Both my father and I connected on our trophies! Another awesome opportunity that you have in this hunt is to kill a wolf! We saw lots of sign, but left right after we harvested our bison. Something we both regret!!! The hunt is great for a couple buddies or a father & son like we did. Kevin McNeil and Blue Sky Outfitters are the real deal!! “As a freelance writer for WILDFOWL and a lifelong enthusiast, I spend as much time as possible each fall on the Canadian prairies. It’s been my good fortune these past two seasons to have hunted with Kevin McNeil and his Blue Sky Outfitters operation in Alberta’s Peace Country. 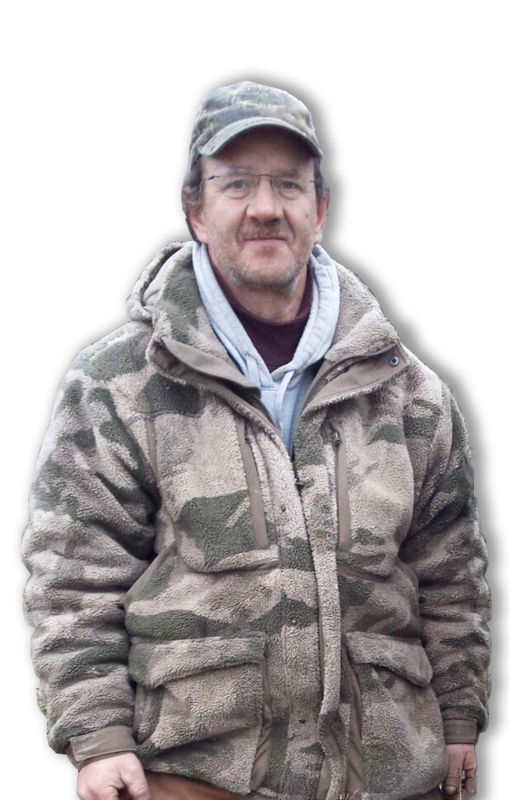 While the ducks and geese are plentiful and particularly cooperative in his neck of the woods, it’s Kevin’s easy-going style that makes hunting with him such a pleasure. He’ll put you in the birds to be sure, but it’s the whole experience that’ll make you happy. And Kevin will be quick to tell you, “If you’re happy, then I’m happy”. “Kevin isn’t lying. I’ve been on hunts all over North America and the hunting with Blue Sky is the best I’ve been on. Not to mention the hospitality! Every duck hunter should make the trip at least once in their lifetime.